From the Author's Story and Prologue in my book, "Creative OCF Lighting Techniques for Photographers," I begin by telling a story from my youth. An accounting of my visit to Amos Carr Studios in Hollywood, California. The value of the story is that of setting a stage, a stage for my own personal journey into the world of photography. "My fascination with photography began in 1953 when my mom took me to Amos Carr Photography Studio in Hollywood, California. Peggy Moran, a close friend of my mom's had suggested that we have some professional portraits taken of me in Hollywood. It was a beautiful spring day in April and my memory of the experience easily comes to mind..."
This adventure, depicted in my new book, "Creative OCF Lighting Techniques for Photographers", would ultimately fast forward to the writing of this book. That is, define a course for my education and professional vocation and ultimately resulting in the sharing of what I had learned; through workshops, my OCF Lighting book and one on one tutoring. In 1956, the school I was attending in Ojai, California, built a black and white darkroom. We spooled 35mm Tri-X movie film ends from the Air Force photo lab into 35mm film cartridges and loaded vintage 35mm cameras. In the spirit of a movie director, I searched for interesting and story telling ideas to photograph. I then processed my film and printed a contact sheet of the 30 plus images I had captured. The era of movie making in 1040's - 1950's in Hollywood, totally captured my attention as I pondered the use of shadows to tell a story. Living in Hollywood, California, I would often walk the boulevard and look into the windows of the various movie houses and photography studios. I was captivated by the way in which light and shadows could tell a story and set a mood. And in the case of the large format portrait cameras, the use of shallow depth of field and placement of the lighting, intrigued me to learn those techniques. A closer look at Paulina's classic beauty is captured in this Film Noir casting of shadows. In today's photography, light quality, particularly as it relates to large soft-boxes or window light, seems to be the go to solution for fashion and portraiture. True, it is easier to set up and use and is far more forgiving in placement, relative to the photographic subject. However, with respect to the true art form of lighting style, as developed in Hollywood during the golden age, has the allure of soft light caused us as photographers to loose sight of the classic art of lighting? Quick Tip: As a bare bulb is not a true point source of light, the term, light quality, also refers to using a bare bulb flash with a reflector. To condition the light such that it doesn't project an image of the flash tube onto the subject, a glass diffuser or Fresnel lens is needed to condition the quality of light being projected onto the subject. 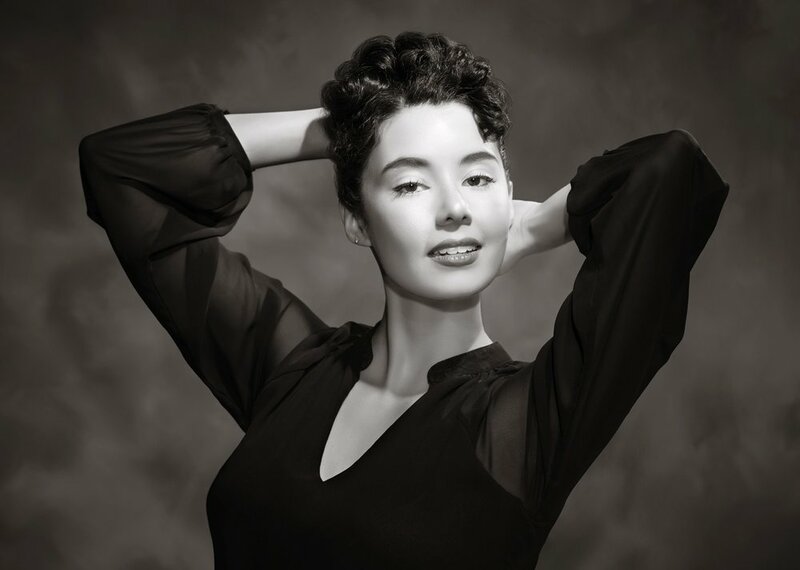 My recommendation, study the photographs of the Hollywood stars from the 1940's to 1950's Hollywood era. Simply type in a movie star's name from that era into a google search and study the drama, beauty and mood crafted with Fresnel lens based lighting. I believe it will awaken the artist in you and alter your course in your study and use of light.